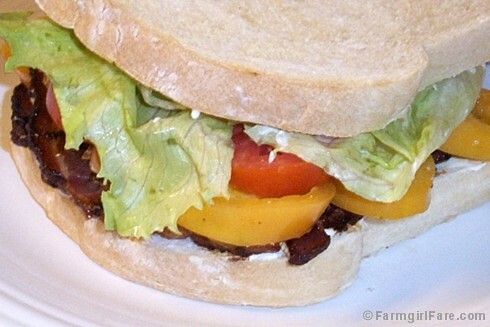 Does anything taste better than a BLT on homemade bread? The sandwiches, which we always have for dinner, must be made exactly right, with juicy and flavorful heirloom tomatoes from the organic kitchen garden, really nice bacon (preferably from a locally raised hog we had butchered to our specifications), crunchy iceberg lettuce (hey, we're in the Midwest), a thick slathering of Hellman's mayonnaise, and perfectly toasted slices of freshly baked Farmhouse White. If you've been longing to learn how to bake your own sandwich bread, my easy Farmhouse White is the perfect place to start, and the recipe includes detailed instructions for beginners. There are also lots of bread baking tips here and here. 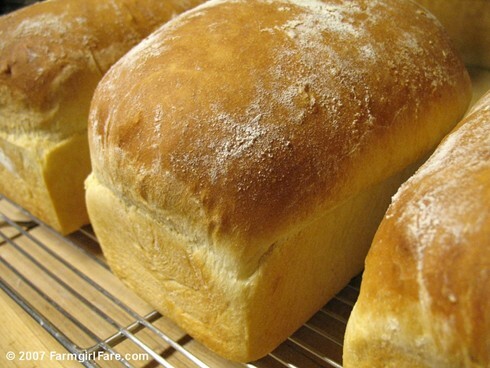 Made with milk instead of water, this is a simple, traditional loaf that's nice and soft, but not too soft. It's great for just about any kind of sandwich and brings peanut butter and jelly, a staple around here, to a whole new level. It's wonderful toasted, smells heavenly while toasting, and makes an awesome BLT. I've been baking this bread for 11 years and have watched plenty of people who claim they never eat white bread gobble slices up. It's one of my most popular recipes, and I've heard from so many nervous novices who are now confident bread bakers thanks to Farmhouse White. Maybe you'll be the next one! © FarmgirlFare.com, busy counting down the hours until dinner. Yep, sometimes good old white bread is just the thing to make the perfect sandwich! I also use milk when I make bread, I have never understood the reasoning behind using dry milk powder and water! LOL! Besides, I have my goat milk to use up! :) Your BLT looks AWESOME!! If you get a chance some day, hope you can stop by my blog for a look, you were my encouragement to start blogging! Thanks again, Susan, for sharing this wonderful bread recipe with us - Delicious!!! I love looking at your bread. Luckily I am genetically incapable of making anything with yeast in it, because if I COULD bake that stuff I'd weigh 300 lbs. So I'll just imagine the smell of it from your pictures. Thanks. If you run out of Iceberg, sliced cucumbers work just as well. AND if you run out of bacon, sliced cucumber and tomato sandwiches still fit the bill. Don't forget the mayo, it's key. Have to give your bread recipe a try. Thank you! for the Hellman's Mayo. I never could understand that salad dressing stuff disguised as mayo :) I can't wait to try your bread recipe! Tomato and Vidella Onion with a little salt and Hellmans's Mayo Sandwich....OMGosh!!!! !